The media seem obsessed with the difficulty of creating party unity and "healing the wounds" of the campaign. I really don't get a sense there will be a lot of wounds. The opportunity for growth will surely make the party put aside their differences and work together under Thomas Mulcair's leadership. Last night the NDP chose a new leader, Thomas Mulcair. Mulcair was the most reformist candidate that was on offer but he was also not the biggest party insider among the candidates. So in a sense he represents a tradeoff between striking out in bold new directions versus staying the course and not attempting to build a bigger, better NDP. Mulcair is someone who has shown he can put partisan allegiance aside and focus on the important goals. Like the leader of the other major opposition party Bob Rae, he has switched his parties over the years. The media seem obsessed with the difficulty of creating party unity and "healing the wounds," of the campaign. I really don't get a sense that there will be a lot of wounds. 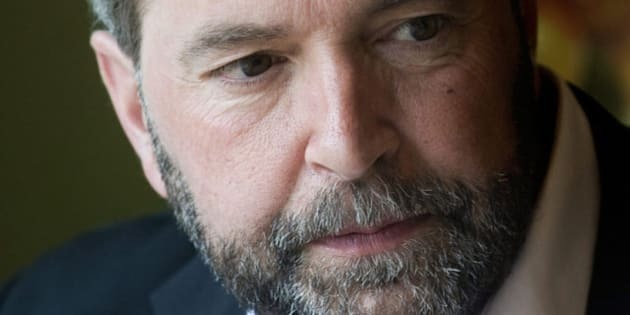 The NDP have less of a history of this than the Liberal party and the opportunity for growth as well as the importance of fighting a single adversary will surely focus the party to put aside their differences and work together under Mulcair's leadership. I thought Mulcair gave a speech that was clear with great ideas. You wouldn't think that to hear most media reports of how it "lacked fire'" though. During the speech he talked a lot about what the NDP can do differently than the Conservatives to bring in young voters. He claims of the youth vote: "It's not that they don't care it's that they don't trust that their vote will make a difference." He says the NDP's performance last election showed "you can vote for the change that you want and actually get it," and again "democracy can't just mean the right to vote... it's the knowledge that your vote matters, that you take part in steering the course of our country's future." That all sounds good to me, but in my mind the obvious, best way to achieve these noble goals is by reforming our electoral process so that all votes count equally and less votes are wasted by winner-take-all counting. So I was excited that was what he would say next. But it was not to be. His point was rather that if the NDP are a viable option to win, and you trust them to do what they actually say, then your vote will count more. Well, yes and no Tom (can I call you Tom?). All parties should always be trying to fulfill their promises when in government. In many ways that is exactly what the Conservative party is about to do this week with their budget and what they have already done with their ridiculous crime bill and destruction of the long gun registry. The real problem is not that politicians don't do what they promise when they get into office, it is that the wrong politicians get into office even though a majority of the country didn't want them in charge. That is why Nathan Cullen's modest proposal was so important and why electoral reform really needs to be front and centre next election if the NDP is serious about making the votes of Canadians count again. "Canadians are well aware of the pitfalls of our electoral system. They agree with us that change is needed. When we get elected, we will get elected with a strong mandate to address those shortcomings. If needed, we will cooperate with other parties in the House of Commons and the Senate in order to make electoral reform a reality." Perhaps the acceptance speech isn't the place to bring that up again. Perhaps the short-term goal of turning the NDP into a "structured opposition" (was it unstructured until yesterday?) and a Conservative destroying machine (not to mention Bloc and Liberal destroying too) is really the best strategy for them right now. All I can say is, he better have lots of fire on Monday in the House of Commons or the media won't stop pestering him.